Not sure about the color? Order free fabric swatches here! Want whoesale pricing? Ordering from outside USA? Call us for pricing. This traditional damask will certainly provide sophistication & class. 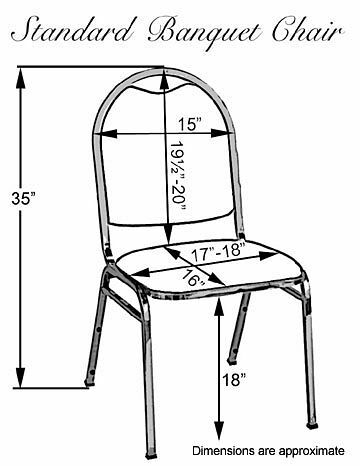 Here are the dimensions our standard banquet chair covers are designed to fit. Please note that our banquet chair covers will only fit round backed chairs with no arms. If you are still unsure which cover you will need, we recommend you order a sample for fitting purposes before placing an order. Please contact us for more information. •$50.00 minimum. Any order under $50.00 subject to the following fees: Orders under $50.00 = $15.00 processing fee. Fee will be added automatically to cart. •Rental & Purchase items may not be combined on orders. Any combined order will be split into two orders by our customer service dept. In this case, below minimum will apply to each order. •Billing & Shipping addresses must be in U.S., Canada, Mexico, United Kingdom, Ireland, Australia, New Zealand, Bahamas, or the U.S. Virgin Islands for online orders. All other International customers please call us at (626) 239-1812 to place an order or email us by clicking here for more information. •Not responsible for dye lot variations. •Items available for worldwide shipping. •Orders usually ship within 48 hours of being placed. Unless otherwise noted. •Some items not available for purchase through our online store. If purchase option is not available on item, please contact us. Machine wash warm, gentle cycle. Tumble dry medium. Remove promptly. Cool iron. Inspect your washer, dryer and iron for areas or objects that may cause damage or snagging. Shake out all linens prior to washing. Remove any excess food, candle wax, skirt clips, etc. Pre-treat any stains with desired stain remover or de-greaser. Test stain remover before use. Wash whites alone and dark colors separately. Wash like fabrics together. Do not mix fabrics. To remove wrinkles from polyester materials - Tumble dry warm. Once the linens are dry, leave them in the dryer without heat until they are room temperature. Remove one at a time and fold while the rest are still tumbling. When trying new laundry processes or fabrics, sample the process on a single cloth (old or damaged if available) first prior to washing a full load to avoid damage to an entire load.